People with less visible signs of aging may benefit from using less extensive non-surgical procedures like hyaluronic acid fillers and platelet-rich plasma alone. 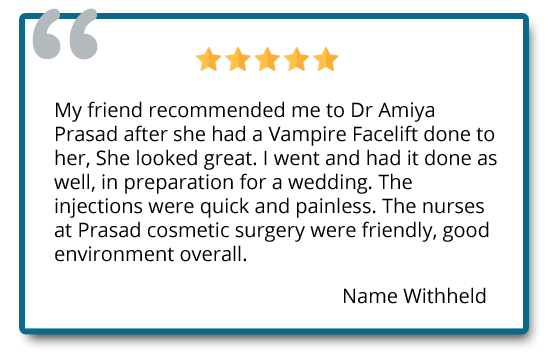 A personal consultation with an accredited provider like Oculoplastic surgeon Dr. Amiya Prasad is the best way to determine if The Vampire Facelift® is right for you. Oculoplastic surgeon Dr. Amiya Prasad has appeared on Fox News New York performing The Vampire Facelift®, and has made a commentary about the procedure in The New York Post, The Daily News, and Access Hollywood. The procedure has been featured nationally on The Doctors, Dr. Oz, CBS News, the New York Times, ABC’s Nightline and The Huffington Post. 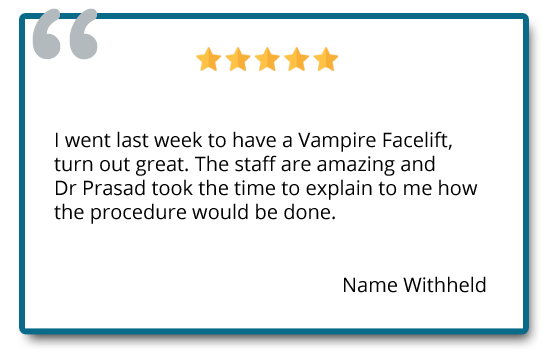 Dr. Prasad is recognized as one of the leading doctors of The Vampire Facelift® by his clients, the viewing public, and by The Vampire Facelift® Inventor, Dr. Charles Runels. The procedure was made famous by Kim Kardashian, who underwent a procedure called “The Vampire Facial” in 2013 (referring to it as a “blood facial”). When The Vampire Facelift® or the Vampire Facial is done properly, the patient will not experience any significant pain or have much blood on their face, unlike Kim Kardashian’s much publicized experience with the procedure. Dermal fillers add youthful volume to the face, while keeping a natural appearance. Hyaluronic acid fillers do not paralyze facial muscles like Botox, so volume is added without inhibiting facial movement or expressions. There is an art to the application of fillers for a natural and youthful appearance, and you can be confident that Dr. Prasad will apply his natural artistic abilities, technical skills and 20 years’ worth of experience to perform your procedure in the best possible way. 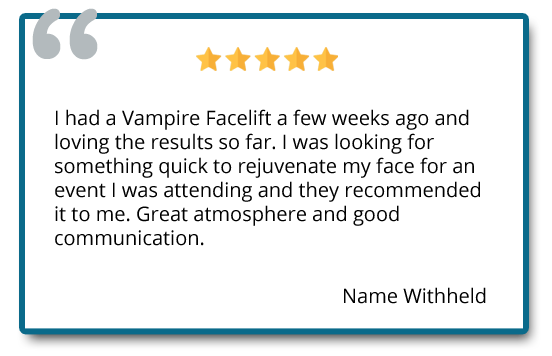 The Vampire Facelift® can be done in conjunction with wrinkle treatments such as Botox or Dysport. 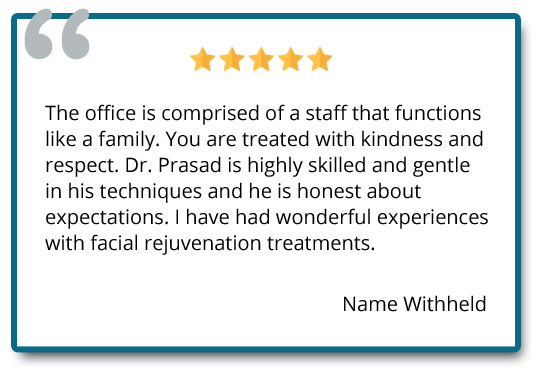 Dr. Prasad can help you determine what complementary procedures are right for your individual case, and develop a treatment plan that you are comfortable with. The renewal effects of the procedure continues for the first few months. Depending on the individual’s response, the effects can last for over a year. Dr. Prasad can help with follow up visits to evaluate your results and customize your plan. Many people coming to our practice choose the Vampire Facelift® because it’s a non-surgical procedure. The term “facelift” when used in the context of the “Vampire Facelift®” describes how volume placed artistically and strategically under the skin can “lift” the skin away from the bony structure creating a more youthful appearance. As people get older, the fat under the skin decreases making the person look more hollow. A facelift is a surgical procedure to reposition sagging cheeks and skin to improve the face, jawline and neck. Many people are hesitant to have surgery because of the risks of anesthesia and the healing process. Dr Prasad developed the Quick Recovery Facelift performed under local anesthesia with minimal intravenous sedation which allows patients to recover faster than a typical facelift performed under general anesthesia. Vampire Facelift® or Vampire Facial® ? In contrast to the Vampire Facelift® , the Vampire Facial® does not use any fillers. The purpose of the Vampire Facial® is to enhance the benefits of micro-needling, with a device such as the Dermapen, by applying PRP (platelet-rich plasma) during and after the micro needling process. Dr. Prasad customizes the depth and the rate at which the micro-needling is done in order to get the most benefit from the treatment for each patient. Micro-needling is skill which is not performed in the same way by every practitioner. The combination of micro-needling with application of PRP (platelet-rich plasma) results in the stimulation of collagen and improvement of the skin. Unlike other injectables such as Artefill, the Vampire Facelift® is natural since it uses the patient’s own healing and growth factors, collected from their blood, in combination with hyaluronic acid filler to revitalize the face. When it comes to wound-healing, there is a well documented synergistic benefit from using hyaluronic acid filler with platelet-rich plasma. Synthetic fillers alone have not shown this benefit and have other risks, which make hyaluronic acid a preferred filler for the Vampire Facelift®. Botox is different than dermal fillers as it is a neurotoxin which decreases muscle activity by affecting nerves which stimulate a particular muscle. 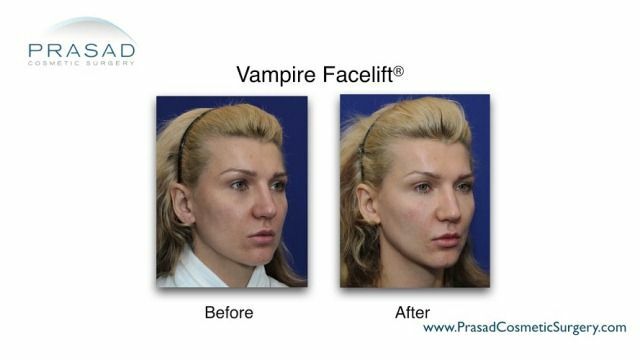 Is the Vampire Facelift® considered a “liquid facelift”? The term “liquid facelift” was used to describe the use of several different types of injectables to enhance a person’s appearance. This means that the Vampire Facelift® is a type of “liquid facelift”. Various type of fillers can be use to get some of the effect of a facelift, from Botox to using your own fat (referred to as fat transfer or fat grafting). Depending on your personal situation, a liquid facelift might be a better option than a facelift, which you can still consider in the future. How much does the Vampire Facelift® cost? The cost of a liquid facelift is dependent on Dr. Prasad’s evaluation of your needs. It’s important that you have a proper evaluation to determine if you are a candidate. Fees are usually determined after Dr. Prasad performs your initial examination. Many people learn about the benefits of The Vampire Facelift® when they understand how the procedure works for their unique facial anatomy. 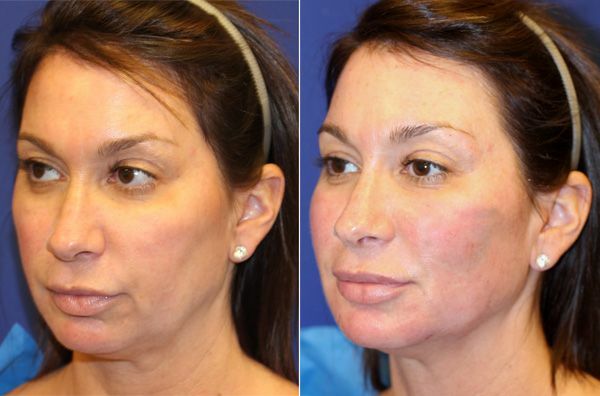 Some patients may also combine The Vampire Facelift® with other facial procedures. The benefit of the Vampire Facelift® continues for a time after the procedure as the growth factors in the blood stimulate the body to create collagen and new blood vessels that result in the improvement facial skin. Dr. Prasad is a renowned practitioner of the Vampire Facelift®, and his Manhattan and Garden City offices are fully equipped with Joint Commission-accredited operating facilities.Schedule your consultation with Dr. Prasad today. The best way to consider The Vampire Facelift® is with a personal consultation with Oculoplastic surgeon Dr. Amiya Prasad. You can contact our offices in Manhattan at (212) 265-8877, or at Garden City, Long Island at (516) 742-4636. Someone is available 24 hours a day, 7 days a week. You can also fill out the contact form below and we will get back to you.